A natural ingredient that also acts as an antioxidant and gentle exfoliant. It lightens dark spots, dull skin, sun damage and pigmentation, minimises the appearance of pores, reduces acne scarring and enhances suppleness. Aka Vitamin B3. This ingredient boosts collagen production, strengthens skin and improves moisture retention. It also accelerates skin cell turnover, resulting in younger, healthier skin. A nutrient that retains moisture, improves skin elasticity and protects the skin from UVB rays that may cause sun damage. A plant root used to even out skin tone and diminish dark spots and blemishes. Rich in antioxidants and Vitamin C, making it a great anti-ageing ingredient for any skin type. It will protect the skin against free radicals and UV rays. It also helps prevent wrinkles and pigmentation. Naturally filtered water originating from pristine environments that is also mineral rich, helps to calm inflammations and balances your skin’s pH levels. After cleansing and toner, carefully remove the Step 1 mask from its packaging and unfold. Adjust the mask to fit and press down gently so it sits evenly on your face. Carefully remove the Step 2 mask from its packaging, unfold and place on top of the Step 1 mask. Loop the first set of ear hoops around your ears and then wrap your chin with the bottom of the mask and loop second set of ear hoops. 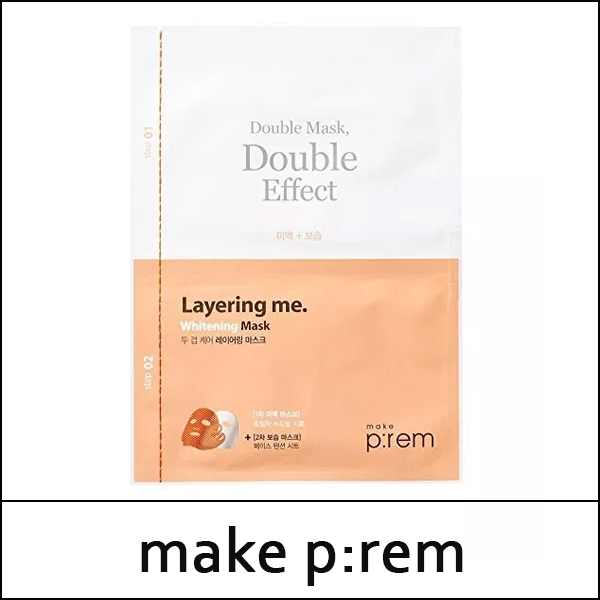 Remove the mask after 20 minutes and pat the remaining essence into your skin. Use the remaining essence in the pack for your neck and arms, don’t waste it!